Ksubi's ss 12/13 collection really tugged at my heart strings. The Australian brands' laid back, surf inspired clothing hit a high note for me when I saw their 'Paradise' print pieces (see the entire collection here). No matter how long I've been in San Francisco, I still get home sick for So Cal. These palm tree prints are just what I need to remind me of growing up by the beach, while I count down the days until I head down to my hometown of San Diego next week. Since I found so many cute paradise inspired items, below are a few more to help you get in the mood for warmer spring weather. By the way, if you're digging palm tree prints on clothing, check out the fab palm print wallpapered interiors on GlamourMash! I'm not sure if I could pull off those pants, but that dress is pretty awesome! As you said I'm following you via GFC, would you like to follow me back? These would be amazing for summer- hurry up please, I'm tired of winter! I love a good paradise inspired printed piece!! These are tre chic too. This trend is gorgeous! I love it! 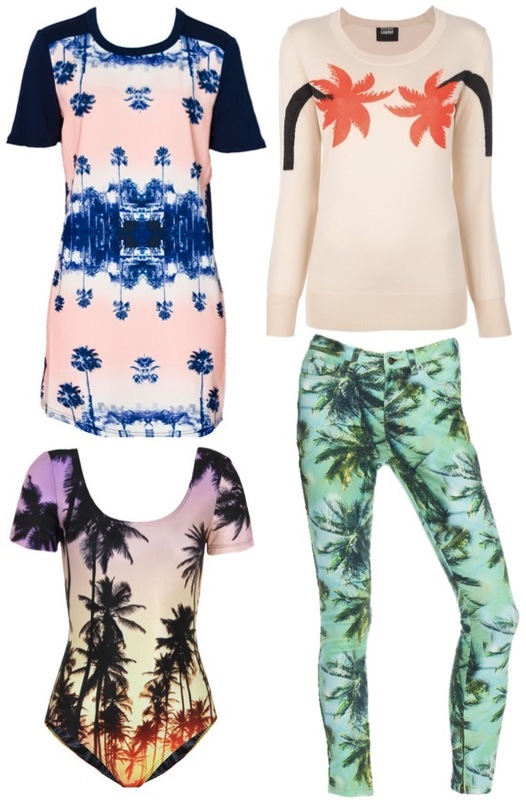 I can't wait for the weather here in the UK to get better so I can start wearing palm trees! Love those palm tree pants! awww fun- I really like those pants! This is very interesting site, i am also glad to visit this site. Great stuff.. Since I was a child, I've always been attracted to palm tree prints. I had several skirts throughout high school. I love that it's now out in much more sophisticated styles and cuts. LOVE your picks!